Road Angel Navigator 6000 includes the advisory speed limit at hazards with unique colour coded screens, latest easy to use touch screen mapping of the UK and full postcode search. The Road Angel Navigator 6000 also includes award winning database of accident blackspots and speed cameras. Road Angel Navigator 6000 has been discontinued. The Road Angel Navigator 6000 is easy to use straight out of the box. The Road Angel Navigator features 2 products in 1 providing satellite navigation with Road Angel speed camera alerts, or the Unique Road Angel only mode. The advisory speed limit are provided at hazards with unique colour coded screens using Road Angel's award winning blackspot and speed camera alert system. The Road Angel Navigator 6000 includes UK street level mapping with full postcode search facility, high visibility 3.5-inch colour screen with built in anti glare, automatic route re-calculation and the internal battery provides 8 hours battery life. The Road Angel Navigator also features latest generation Sirf3 GPS receiver,MP3 player and photo viewer. The Road Angel Navigator 6000 Global Positioning System comes with a suction cup bracket for easy installation. 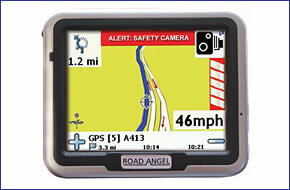 The Road Angel Navigator 6000 is pre-installed with the UK map and speed camera database. Europe mapping available separately for Road Angel satnav. The first six months of speed camera updates are free of charge. Subsequent subscription charge of £3.99 per month by Direct Debit, a minimum 12 month contract is required.